What is the PCCN Test? Nurses who are interested in becoming a Progressive Care Certified Nurse (PCCN) must pass the PCCN test. The PCCN exam is administered by the American Association of Critical-Care Nurses (AACN), which is the largest specialty nursing organization in the world. The PCCN examination tests applicant’s knowledge on caring for acutely ill adult patients. This certification is ideal for nurses who work in fields such as direct observation, intermediate care, telemetry, stepdown, emergency departments or transitional care. The AACN offers PCCN test and PCCN-K certification. The PCCN is geared for nurses providing direct care to acutely ill adult patients. The PCCN-K is suited for nurses who don’t provide direct care but influence the routines and practices in the field. What are the requirements for taking the PCCN test? Licensure. To take the PCCN test, applicants must have an active, unencumbered RN or APRN license. The license must be issued in the United States and free of provisions and limiting conditions by any state board of nursing. Experience. Applicants must meet one of the two clinical practice requirements. Option 1: Within the last 2 years, the applicant must have 1,750 hours of practice as an APRN or RN, providing direct care to acutely ill patients. 875 of those hours must be earned in the most recent year preceding the application. Option 2: The applicant must have at least 5 years of experience as an RN or APRN, with at least 2,000 hours of experience providing direct care to acutely ill adult patients. 144 of those hours must be earned within the most recent year preceding the application. Please note that orientation hours, in which you shadowed another nurse who was assigned an acutely ill patient, cannot be counted towards PCCN eligibility. If you were the assigned nurse and had another nurse shadow you while working with an acutely ill patient, you may count those hours toward your PCCN eligibility. Nurses with managerial or education positions may apply hours spent supervising nursing students or nurses at the bedside. These hours are only eligible if the applicant participated in the direct care of the acutely ill patient. How do I apply for the PCCN test? There are two application options for the Progressive Care Certified Nurse (PCCN) examination. Online Application. Applicants can complete the application online, on the AACN website. The application will ask you for your RN or APRN license number and expiration date, as well as contact information for a co-worker or clinical supervisor, who can verify your eligibility. You may use a credit card (American Express, Visa, Mastercard, or Discover card) for payment. Your application will process within the same day. Paper Application. For applicants applying with a group, taking a paper and pencil exam, and testing outside of the U.S., a paper application is required. The application will ask for your RN or APRN license information and an honor statement. You may process the payment with a credit card, money order, or check. Your application will be processed in 2-3 weeks. When filling out the application, please use your legal name because it has to match the name on your photo identification, which you will provide on test day. 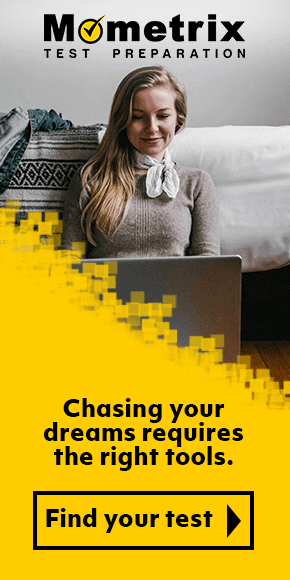 After applying, you will receive a confirmation email stating that you successfully applied. Approximately 5-10 days after the confirmation email is sent, qualifying candidates will receive an approval-to-test email and postcard from AACN’s testing service, PSI/AMP. 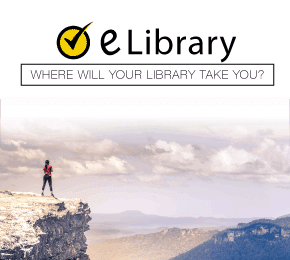 The email and postcard will include an exam identification number, instructions for scheduling the exam, and a 90-day window for scheduling and taking the exam. The PCCN test is offered all year-round, Monday- Friday at 9 a.m. and 1:30 p.m. Depending on the location, Saturday appointments are available. How much is the PCCN test? The Progressive Care Certified Nurse (PCCN) exam is $185 for AACN members and $285 for nonmembers. If applicants need to retake the PCCN test, it’s $135 for AACN members and $215 for nonmembers. The PCCN renewal fees are $135 for AACN members and $215 for nonmembers. Applicants who submit their application online can pay with a credit card. Applicants who mail in their application can pay with a credit card, check, or money order. There are discounts available for groups of 10 or more, who submit their applications in the same envelope. 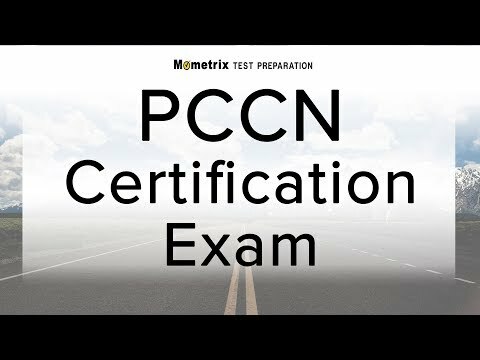 What topics are covered on the PCCN test? The Progressive Care Certified Nurse (PCCN) examination is developed from the AACN Synergy Model for Patient Care. 80% of the test focuses on Clinical Judgement, while the other 20% focuses on Professional Caring and Ethical Practice. Some of the topics include neurology, hematology, caring practices, and clinical inquiry. How many questions are on the PCCN? The PCCN test includes 125 multiple-choice questions. 100 questions are scored, while the other 25 questions are used to gather data for future tests. The PCCN examination is 2 ½ hours. Applicants can take the test at a PSI/AMP testing center. Applicants taking the paper and pencil exams will receive their results in 3 to 4 weeks, following the test date. The computer-based exams provide the results at the end of the test. What are some study resources for the PCCN? We can both agree that the traditional test-taking methods aren’t effective. So, our test experts created the Mometrix PCCN Study Guide. This easy-to-use study guide explores the many concepts assessed on the PCCN examination. Understanding the structure of the test is equally important, so the Mometrix PCCN Study Guide also includes effective test-taking strategies and secrets that will help you on test day. Understanding the concepts and test structure is only half the battle. Studies show that repetition is one of the most effective test-taking strategies. 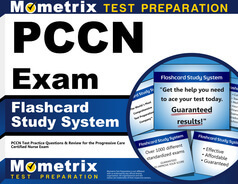 Our experts have carefully assessed the PCCN exam and created the Mometrix PCCN Flash Cards. These professional-quality flash cards are easy to read and durable, so you can study on the go! We look forward to assisting you on your journey to becoming a Progressive Care Certified Nurse. Mometrix Academy is a completely free PCCN review resource provided by Mometrix Test Preparation. If you find benefit from our efforts here, check out our premium quality PCCN review book to take your studying to the next level. 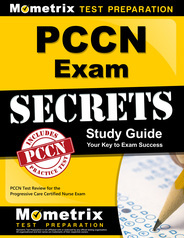 Just click the PCCN Exam Secrets Study Guide link below. Your purchase also helps us make even more great, free content for test-takers. Our customers love the tutorial videos from Mometrix Academy that we have incorporated into our PCCN test study guide. The PCCN study guide reviews below are examples of customer experiences. I like the way the information is actually explained in understandable terms. I answer the questions then check the answers. When I get one wrong, I write myself a note about what to study then I go back in the manual and read all about that subject. (I also have a book that only has the material in outline form which wasn’t helping me learn what i needed to know.) I like this book much better than the other one I was using. Several of my coworkers have looked at this book and love its readability. One has already purchased her own copy!. I love how it breaks down information into simple, easy to read paragraphs that are not too detailed or overwhelming. I can see the clinical indications for understanding the material I read. I am looking forward to the practice test once I finish reading the book. Thank you for this study guide! Amazon reviews led me to this book, and I can safely say they were right! Very good study guide. I had another study book that had so much information on each section that it would be impossible to remember it all. This book covers the section with just the info you need to know. They claim to cut through the fluff and they do. The reader is also given tips for studying and test taking. This book is great. It has both content and quizzes. Having both the quiz and rationale in one place is extremely helpful. This is my first time taking the PCCN and I believe this book will greatly improve my chances of passing the test the first time. The explanations are straightforward and easy to read. All the points are addressed. I liked the questions that includes rationales. I was looking for the book that does not include unnecessary information, and this book met my needs. I have gotten half way through this product, and it is not only helping me prepare for my PCCN exam but helping me become an even better nurse. The things I have learned or refreshed myself on are helping me in real life situations that I face as a floor nurse everyday. My scores on other practice exams are dramatically improving, and I’m beginning to feel more confident! This study guide worked well for me! It was a great refresher of diseases I have learned and gave detailed information on illnesses I was not familiar with. Very straightforward and easy to reference. I was looking for study materials that would meet my needs as I studied for the exam. Mometrix study aids exceeded my expectations in many ways. I thought the studying would be laborious and boring, but the Mometrix tools were quite the opposite. They held my attention and made me want to learn the information. Most of it was review from nursing school, but I certainly could not have mastered all this material without the Mometrix tools. I may even go on to study for another exam now because of the confidence Mometrix has given me. Also, the flashcards are a fun way to test yourself as you study from the test manual. I rate this product 5/5 because this product thus far the best study guide I have bought. The review contents are concise and very easy to understand. It is what I need to know not only for taking the certification exam, but also provides the knowledge I can use to apply in my daily practice. Compare to others preparation books I have bought, Mometrix helps me understands the gaps of knowledge in a very short amount of time and make me feel ready to go to take this test in a short time frame. I recommend it to anyone especially if you have limited of time to study. This study guide seems to have everything you need. You can’t ask for more. From its body system explanations, to its practice tests, answers and explanations and more importantly its 5 secret key to success and a lot more. Its 5 secret key to success is really cool. You should not miss learning about them. There’s a bunch of general test-taking strategies presented in this study guide that will help you. You will know how to make predictions, answer the question, avoid “fact traps”, benchmark, milk the question, eliminate answers, brainstorm and it’s already too many to mention.